Now, I’m a Xingyi Man, so I’m already partial to Offensive Strategy. That being said, I still wouldn’t agree with this view of the idea. Nothing against the gentleman making the statement, I don’t know Mr Graham & have never come across him before. But this is a naive view at best. Here’s why. Mobility – which side moves more freely & quickly? Distance – which side controls both positive & negative space more effective? Timing – which side is more sensitive to the ebb & flow of circumstances created by enmeshing two opposing forces? Power – which side can deliver an actual finishing blow to their opponent? With these factors defined, we can discuss strategy. The most broad division that can be made is the simple “offense” or “defense” distinction, which is the best to use in this discussion. The assertion that “the best defense is a good offense” is just an excuse for “mindless aggression” is only made by one type of person, as any serious martial artist knows. Experienced fighters understand that different opponents can be dangerous under different circumstances: a strong boxer will be more dangerous in an area where going to the ground isn’t feasible, just as a skilled juijutsu user will be more dangerous on open, level surfaces. There is a strategy that works on all types of fighters, at all levels of conflict, under almost all circumstances: the Unbalancing Strategy. In short, Unbalancing consists of preventing the opponent from establishing his rhythm & then taking control of the pace of the conflict. Additionally, there may be an element of alternating intensity of attack. The easiest way to control the pace of a conflict while also disrupting the opponent’s rhythm is to make use of tactical aggression. What is tactical aggression? It is, in fact, “the Best Defense is a good Offense.” This seemingly circular reasoning is quite clear once you recognize the difference between “tactical aggression” & “emotional aggression.” Tactical aggression seeks to control the pace of an exchange by seizing the initiative & pressing the opponent, putting him on the defensive. The opponent is obliged to respond to your actions & is not permitted an opportunity to use his preferred techniques. Emotional aggression is exactly what it sounds like: an emotionally fueled flurry of undirected or semi-directed aggression, as seen in the outbursts of small children. Seizing the Initiative relies on pressing the opponent at one or more vital points that he is obliged to defend. By targeting certain areas on the body, face, throat, solar plexus, or crotch, for example, you can draw a guaranteed reaction from almost any opponent. These are places all humans defend out of reflex. Controlling the distance at which the encounter takes place is the element of Seizing the Initiative. Everyone has a natural range they prefer: larger people generally like Long Range encounters, smaller people generally want to get in closer; muscular people love to grapple, while thinner people favor hit & run tactics. Taking this type of choice away from an opponent, either by landing the first blow or preempting them with mobility, induces cognitive dissonance in most people. As we all know, a confused opponent is an easily defeated opponent. 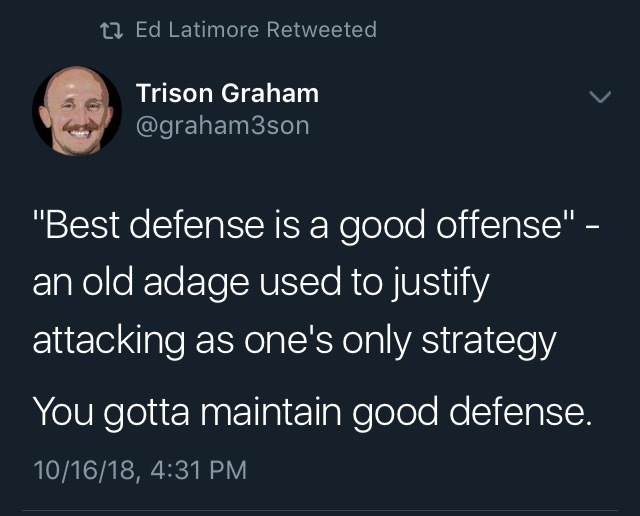 When viewed from the perspective of Seizing the Initiative, “the Best Defense is a Good Offense” makes sense. An opponent who is constantly on the defensive himself is in no position to threaten you. It is in no way the mindless aggression that armchair strategists & know-nothing amateurs like to portray it to be. Overly cautious types never seem to realize the qualitative differences inherent in different situations. They mistake attacking for mindless aggression, just as they mistake cowardice for caution.